Squeaky (8-10 years old as of January, 2017) is a neutered male black short-haired cat. 'Squeaky' got his name from his very distinct and frequent meow, which is not actually high pitched or squeaky but a deep soulful yowl. 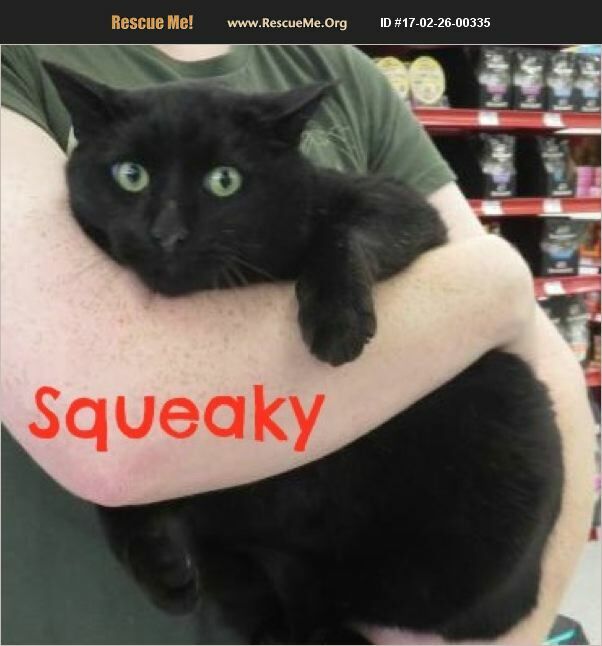 Squeaky was found as a friendly adult stray back in 2011 when he was thought to already be a few years old and was taken in as an indoor outdoor cat by his caretaker after going through our trap neuter return program. Sadly his happy arrangement ended when his caretaker passed away recently so we are looking for a new place for Squeaky to retire since as a young senior cat it would be better for him to stay indoors now. He can be a little shy around new people or strange places but he loves being pet and held and warms up quickly. He especially loves to be brushed and will reward you will head butts and a little drooling. He has two siblings also available for adoption that he gets along with but we don't feel they need to be adopted together. He gets along well with other cats, but doesn't have much dog experience and would probably do best with no dogs or only one older, calm dog.